A 92-year-old who killed herself after suffering from depression and insomnia was feeling "overwhelmed" by charity requests, a report has said. Olive Cooke's details were on file with 99 charities and in one year she received 466 mailings, the Fundraising Standards Board (FRSB) found. 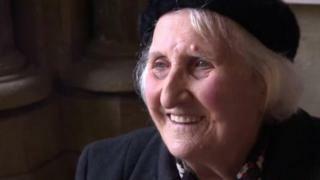 Mrs Cooke, from Bristol, was known as one of the West Country's longest-serving poppy sellers. The board is seeking improvements to the Code of Fundraising Practice. It found that about 70% of the charities who contacted Mrs Cooke acquired her details from third parties. The board said forthcoming changes would ban charities from sharing data "without express consent", and charities "must provide clear opportunities to opt out of further fundraising approaches in every written communication". Andrew Hind, chair of the FRSB, said: "Mrs Cooke's experience demonstrates the inevitable consequences of a fundraising regime where charities have been willing to exchange or sell the personal details of donors to each other, and to commercial third parties. "But Mrs Cooke was not alone. Her experiences were echoed in the many complaints that the FRSB received following her death." Mrs Cooke's family previously said the charity requests she received, while "intrusive", were not to blame for her death. She had collected money in Bristol for the Royal British Legion for 76 years and an inquest into her death heard she had "long term issues with periodic depression". Mrs Cooke was found dead in the Avon Gorge, Bristol, on 6 May and a verdict of suicide was later recorded by the Avon deputy coroner.